The quilt finally got that row added, and it's ready for another. One a month is a bit slow, but I'm still optimistic about finishing this, someday. The clanger is now up to the row where the arm holes are, so I need to refresh my knitting knowledge. I'm not Wii Fitting everyday, but I have been working on it if I get a spare 5-10 minutes. Again, optimistic, maybe to finish this summer. The headphones are still an outstanding issue- I just haven't done anything on this one. It's a source of shame. My patchwork ambitions have been put on hold for the moment, and I'm feeling alright about that. I'm planning to go to the big quilt show at the NEC in August (and visit the in-laws), and it will be just fine to go as an observer rather than a participant. The next steps in the great-secret-birthday-gift were taken, but then one was un-taken and will need to be re-taken. Another secret step is ready to be taken. I have a feeling this will be a rush job in July. The weaving of the rag bag is progressing nicely (see the action shot of me on the way to the great Chorlton Big Green Festival). 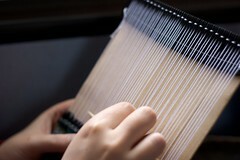 I do enjoy the weaving, and it is a nice bus riding craft even if I occasionally forget the bit of yarn I want to use. Also, I found a broken polka-dot umbrella at the bus stop that will make a nice bit of lining for the bag, when it finally gets to that stage. It isn't a quick project though, and with a short work week coming up, I'll probably not have a complete bag until after next weekend. This is a tiny bit annoying, because I have my next issue of the Tanglecraft DIY Weaving Club zine, but it will just have to be put in the someday pile for the time being. Another project note to get down: the balcony and kitchen window sill are now home to some experimental gardening. For years, I've thought about gardening, planning sowing times, reading about container plants, etc, etc, yawn, yawn. This year, I concluded that the best option is to just put a lot of seeds in some compost, water, and see what happens. If anything grows, it will be tons better than just having the seeds sitting in their neat little envelopes. As P is fond of saying, "Best is the enemy of good"